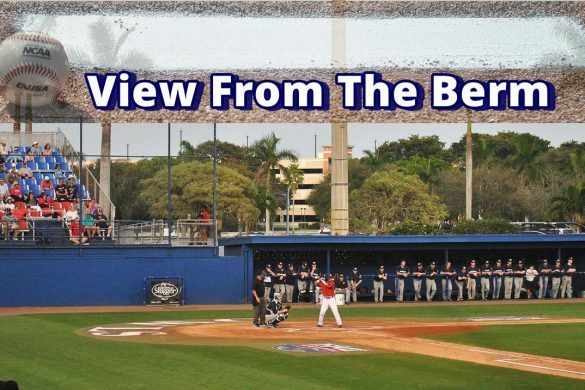 BOCA RATON – FAU blasted its way to a 15-2 blowout victory over Western Kentucky to open the final series of the regular season. A nine-run second inning highlighted by David Miranda’s grand slam, put the Hilltoppers into a deep hole that they could not get themselves out of. The Owls rallied with two outs in the inning, putting eight consecutive batters on base, which gave them a 9-1 lead early. 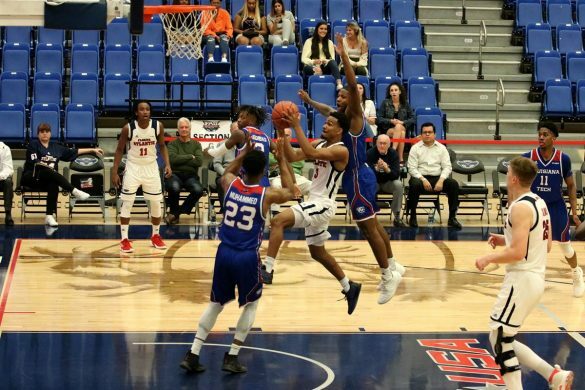 “It was play discipline that got us going in the second,” Coach McCormack said. The Owls were able to overcome a rocky start, where Jake Miednik gave up one run on two hits and two errors in the first inning. Miednik pitched only four innings, giving up one run on seven hits, while finishing with five strikeouts. The Owls put together their best offensive performance of the season, with every player in the starting lineup collected at least one hit. “It was one of those nights where it all worked in our favor,” McCormack said. Moving Forward: Joe Montes went 2-for-4 with two RBI and a home run…. Andru Summerall hit two solo homers. …Relief pitchers combined for six innings allowing one run on four hits. 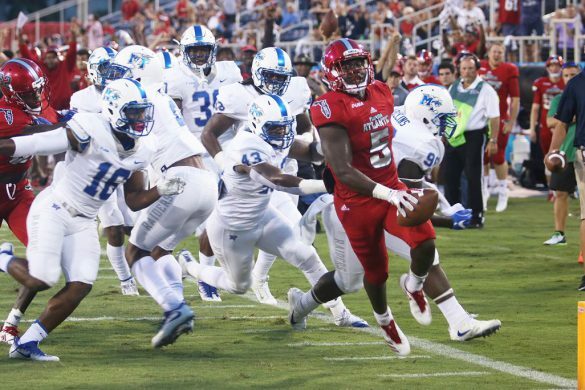 Sliding Backward: The Owls had a tough start which included two errors on one play. Jake Miednik overthrew shortstop Tyler Frank at second, then Cody Wilson bobbled the ball in the outfield. The play led to Western Kentucky’s first run of the game. Key Stat: 5 – home runs hit by FAU. Up Next: The Owls host Western Kentucky tomorrow night at 2 p.m.
WEST PALM BEACH – FAU overcame a poor defensive performance at The Ball Park of the Palm Beaches, to defeat UCF 11-8, giving the Owls a good RPI victory to add to their postseason resume. Designated hitter Jared DeSantolo went 3 for 4 and drove in three runs, one of which came on a two-RBI single in the bottom of the fifth inning which gave the Owls some breathing room. 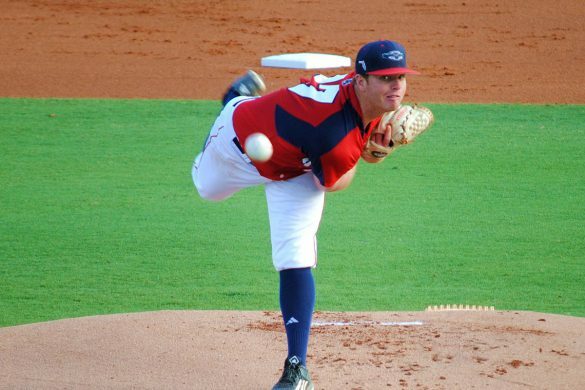 FAU needed to rely on its bullpen on Tuesday. Working on a pitch limit designed to allow him to start again this weekend, starter Mike Ruff only pitched two innings, allowing two unearned runs on two hits. Nick Swan came in relief in the top of the third inning and allowed a two-run home run to Tyler Osik, giving the Knights a 4-2 lead. The Owls struck back immediately. David Miranda’s two-RBI triple in the bottom of the third followed by a Joe Montes grounder which allowed FAU to regain the lead, 5-4. 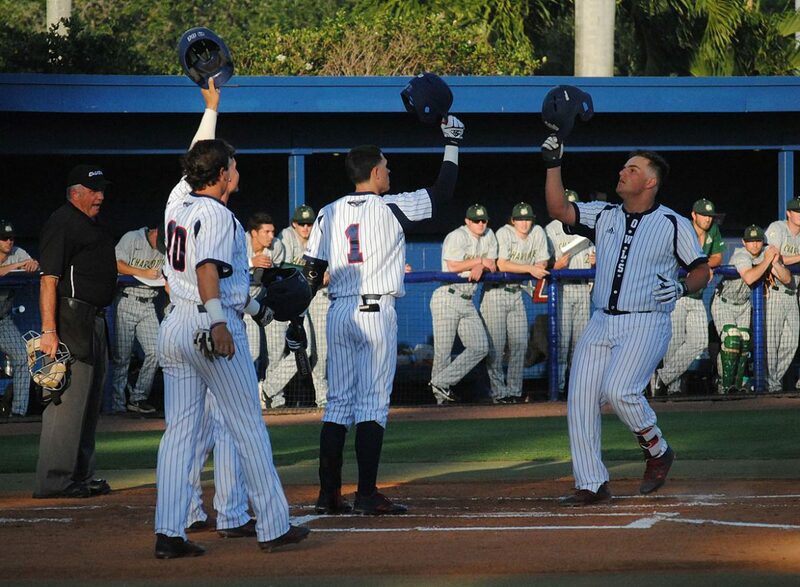 Joe Montes’ RBI single in the bottom of the fourth broke a 5-5 tie and FAU never looked back. Despite the two errors, dropped fly ball by Gunnar Lambert, and poor relief pitching early on, the Owls were able to pick up their 32nd win of the season. Reliever Jordan Poore stabilized the Owls at the mound, taking the ball with one out in the fifth and throwing 2 2/3 hitless inning to get the ball to Drew Peden, who earned his third save of the season. Moving Forward: David Miranda went 2 for 5 with 2 RBI. …Gunnar Lambert went 2 for 3 with a RBI… Eric Rivera went 3 for 4 with a RBI. Sliding Backward: Catcher Pedro Pages, the Owls’ cleanup hitter most of the season, will undergo surgery on Friday to remove the hook of the hamate bone in his left hand, McCormack said. He is expected to miss the remainder of the season. …Zach Schneider, the Owls closer since the start of the season, entered in the fourth inning and pitched 2 and 1/3 innings, allowing three runs on four hits. He did, however, earn the win. Key Stat: 3:57 – time of the game, making the ballgame the longest contest in the two-year history of the Ballpark of the Palm Beaches. Up Next: The Owls head to Middle Tennessee Friday night for their last Conference USA road series of the season. 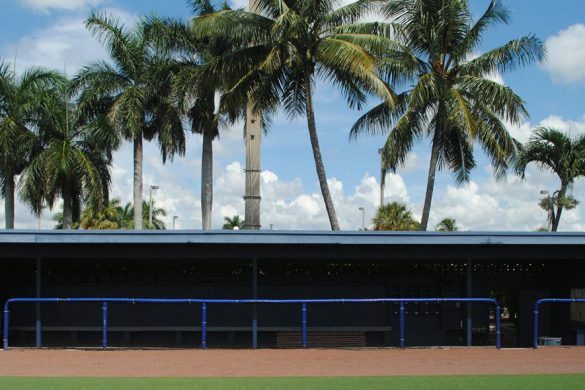 BOCA RATON— The inability to execute good pitches from the bullpen and poor at-bats to start the game led to FAU to its 10th loss of the season, falling to FGCU 4-2. FGCU shortstop Christian Proffitt helped the Eagles get off to a 2-0 lead with a RBI ground out in the second inning, and a RBI single in the fourth. FAU showed life in the bottom of the fourth, threatening with the bases loaded. Gunnar Lambert was hit by a pitch which drove in the first FAU run, but the Owls left the bases loaded the following batter as Cody Wilson lined out to right field. McCormack cut short starter Mike Ruff’s performance after 52 pitches, preserving him for this weekend in the case that Mark Nowatnick is not able to start Sunday’s game. Blake Sanderson relieved Ruff and gave up a solo home run to Richie Garcia in the top of the fifth. Another failed opportunity came in the bottom of the eighth inning, when Lambert flew out to right field with runners left on first and second. 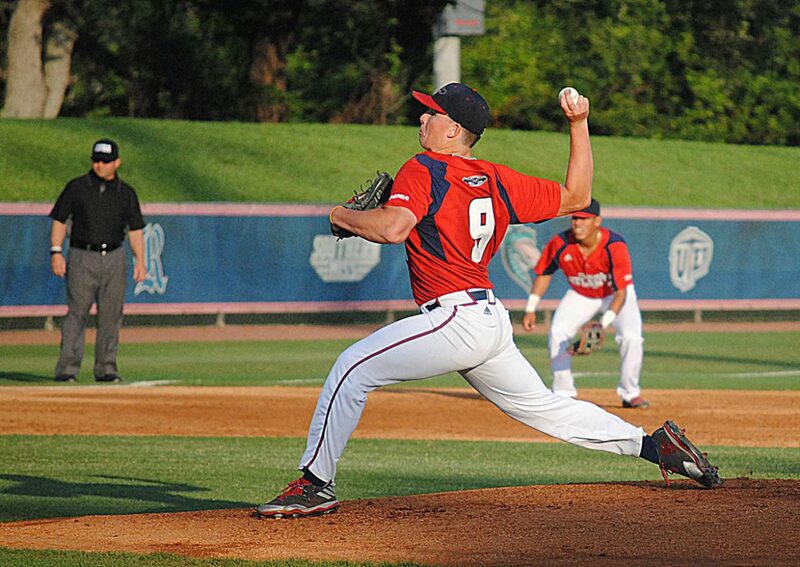 Moving Forward: Marc Stewart pitched 2 1/3 innings, allowing one run on two hits, with two strikeouts. …Joe Montes went 3 for 4. …Jordan Poore singled in four at bats, made a terrific catch at the wall when he was playing left field and also struck out two in 2/3 of an inning. …Jake Miednik should be ready to go this weekend after suffering a minor injury that led him to miss his Friday night start, McCormack said. Sliding Backward: David Miranda went 0 for 4 with a strikeout, but his hustle on an ground out precented a double play, leading to FAU’s first score. …Sunday’s starter is still yet to be announced, as McCormack is unsure whether Mark Nowatnick will be able to start Sunday’s game. Key Stat: 8 – hits FAU totaled through Wednesday’s game, which led to eight runners left on base. 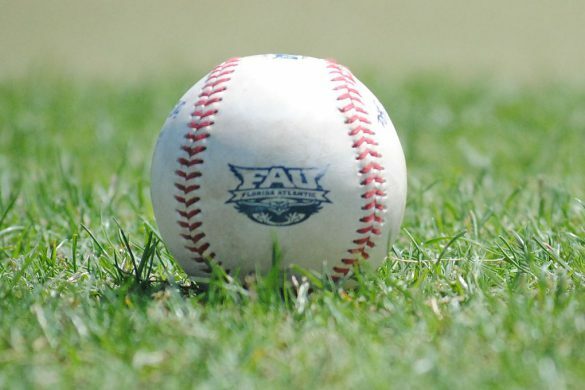 Up Next: The Owls host UAB in Boca Raton Friday night at 6:30 p.m.
BOCA RATON – UTSA pitcher Chance Kirby stymied the Owls for 6 2/3 innings, allowing the Roadrunners to defeat FAU 8-1 in a windy series finale. 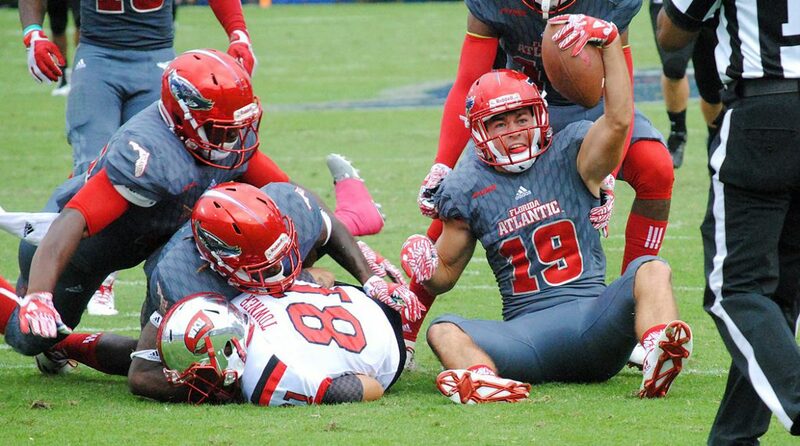 As is becoming a pattern on Sundays, FAU fell behind early. UTSA’s Ben Brookover lined a single over the head of second baseman Eric Rivera for the first run of the game. It didn’t get any easier for FAU starter Mike Ruff, as UTSA scored two more runs in the top of the second inning. FAU pulled Ruff after two innings. Things continued to unravel for the Owls in the top of the seventh inning. Reliever Blake Sanderson gave up three runs, on four hits and one error, extending the Roadrunners lead to seven. In the bottom of the seventh inning, the Owls showed some life when Tyler Frank hit a line drive in left field to bring in the FAU’s first run, putting an end to Chance Kirby’s shutout. “He was one of the better guys we’ve faced in the conference this year,” McCormack said. 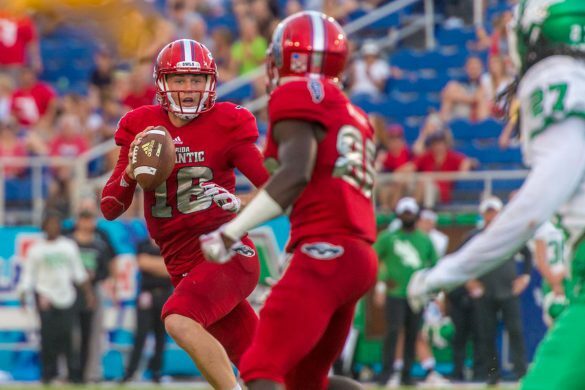 The loss snapped FAU’s season-high winning streak at nine games. Moving Forward: Reliever Mark Nowatnick pitched three innings, allowing one run on four hits. …Tyler Frank went 1 for 2 for a RBI, extending his on-base streak to 30 games. 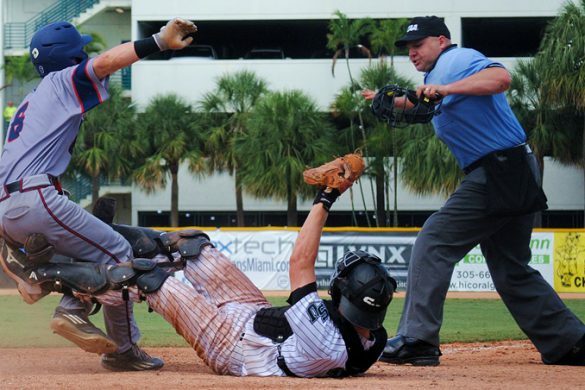 Sliding Backward: Cody Wilson homered in both of the first two games but went 0 for 4 Sunday with a strikeout. …Mike Ruff needed 52 pitches to get through the first two innings, allowing three runs on four hits. 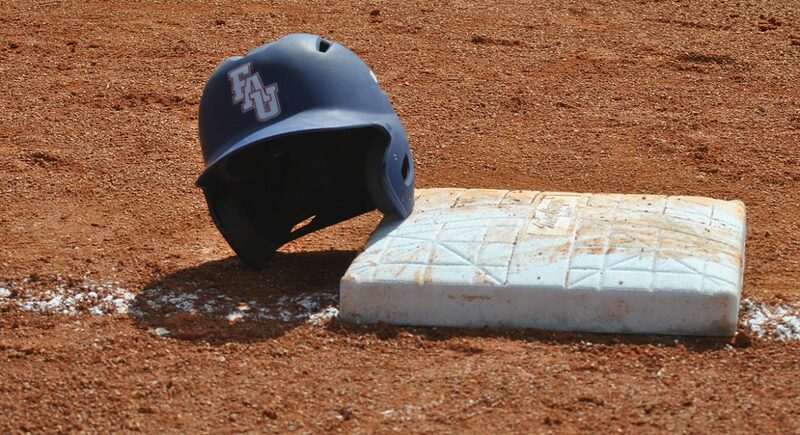 …The Owls committed two errors, adding to their weekend total of seven errors. ng>Key Stat: 16 – hits surrendered by FAU’s six pitchers. 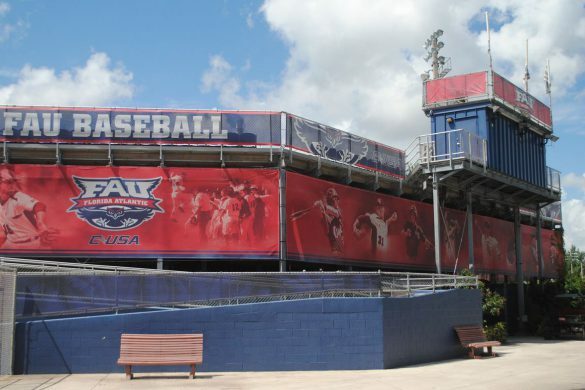 Up Next: FAU hosts Bethune-Cookman Tuesday night at 6:30 p.m.
BOCA RATON – FAU threw out UTSA’s potential tying run out home for the final out of the game to preserve its ninth consecutive win, a 3-2 victory over the Roadrunners. With FAU leading 3-1 and UTSA runners on first and third, Ryan Stacy doubled into the right field gap. Right fielder David Miranda tracked down the ball and sent it back to the infield, where a laser beam throw by shortstop Tyler Frank to home plate nailed Brian Arias. 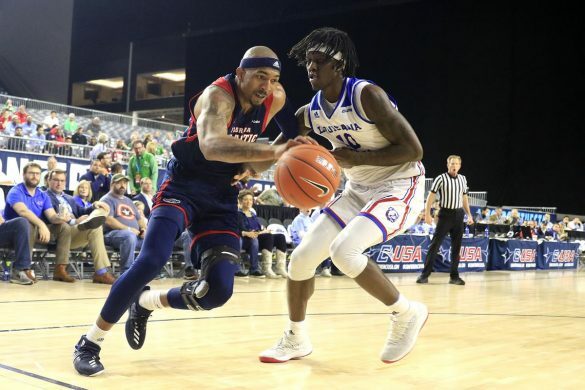 “Exciting ending,” FAU coach John McCormack said. 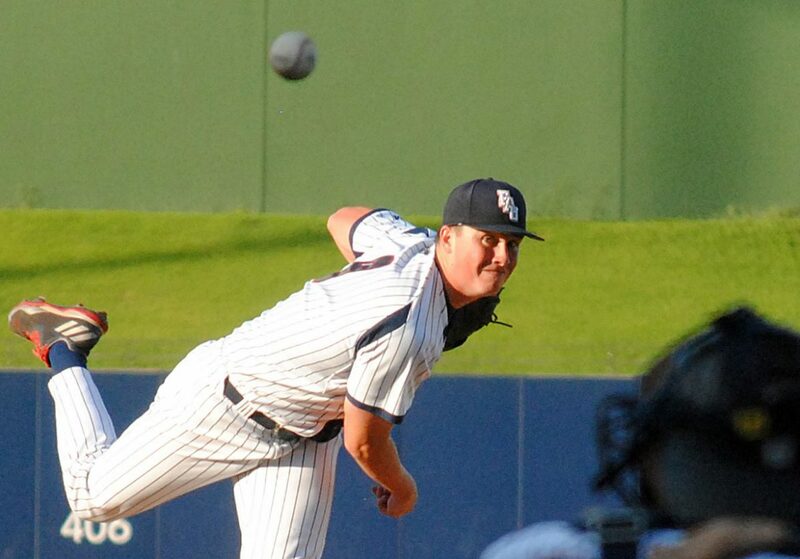 Prior to that ninth inning, FAU shut down UTSA’s bats. Starter Vince Coletti delivered his best outing, giving up six hits while striking out three in a career-high eight scoreless innings. “I thought Coletti was really good,” McCormack said. 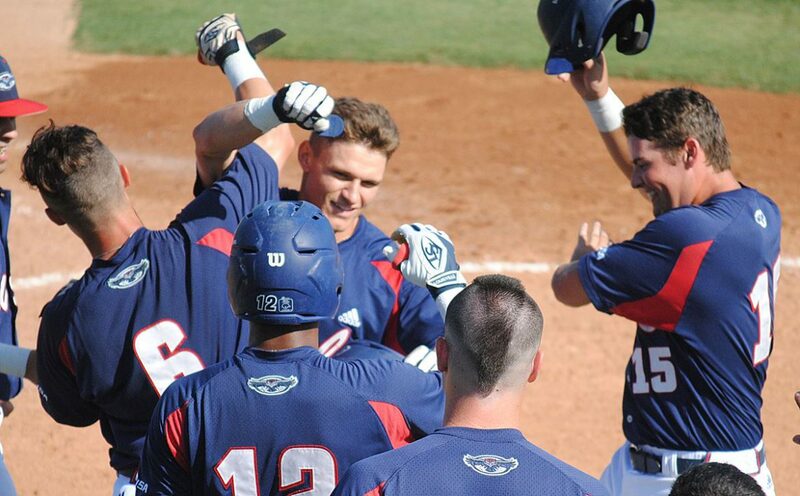 Cody Wilson’s two-run home run, his second round tripper in as many days, gave the Owls a 2-0 win. Eric Rivera’s eight inning RBI single up the middle extended the Owls lead to 3-0. The current nine-game winning streak is the Owls’ longest of the season. Moving Forward: The home run was one of three hits for Cody Wilson on Saturday in three at-bats. Tyler Frank’s bat remained hot. His fifth inning single extended his on-base streak to 29 games. …David Miranda enjoyed a two-hit afternoon. Sliding Backward: Tyler Frank’s glove ran cold. He committed three errors, one that allowed a run to score in the bottom of the ninth with two outs… Joe Montes went 0-for-4. …Kevin Abraham went hitless in three at-bats and failed to catch a third strike, prolonging the ninth inning. Key Stat: 100 – pitches for Coletti, 66 for strikes. Up Next: Sunday’s series finale against UTSA has been moved up to 11 a.m. in hopes of avoiding expected inclement weather. Mike Ruff gets the ball for FAU. BOCA RATON – Jake Stoshak’s college football career has been a battle for playing time. 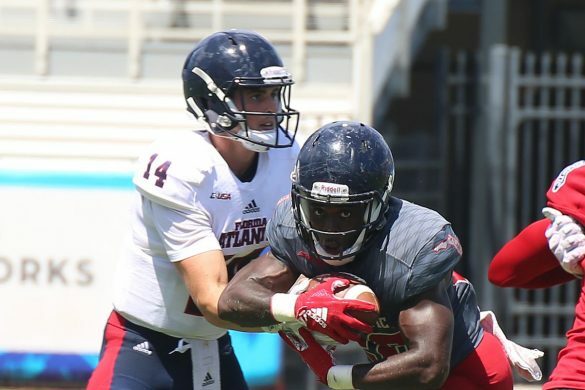 At one point a starting safety when Charlie Partridge was FAU’s head coach, Stoshak now sees himself as a key contributor on special teams under Lane Kiffin. There isn’t been a definite role for Stoshak, as he’s bounced around between different positions. He can line up at any spot other than kicker on kickoff and remains a reserve team, but his most noticeable role may be the holder on special teams. Last season Stoshak served as the back-up holder, with the now-graduated Ryan Rickel working as the Owls’ primary holder. 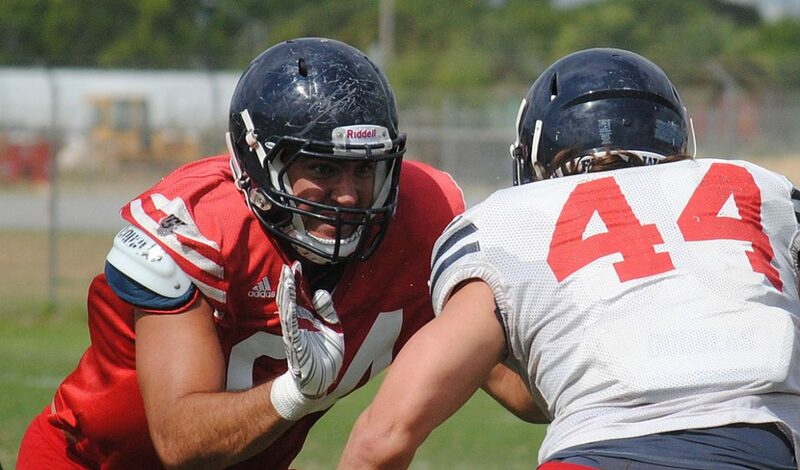 Early in his FAU career Stoshak played free safety, but now can play either safety on the scout team in practice. This staff trusts Stoshak to be able to come in at any point if needed throughout the season. Stoshak recorded a career-high 26 tackles in 2015 – 10 of them coming against Miami. He added 22 more the following season, and recovered fumble on special teams. Last year Stoshak played in 10 games and didn’t record a tackle. “He’s one of those guys that you could throw him in at any point in the game and you know he’s going to do his job, so that’s always good,” linebacker Azeez Al-Shaair said. Owl fans may be familiar with the last name Stoshak, because of Jake’s brother Jenson. 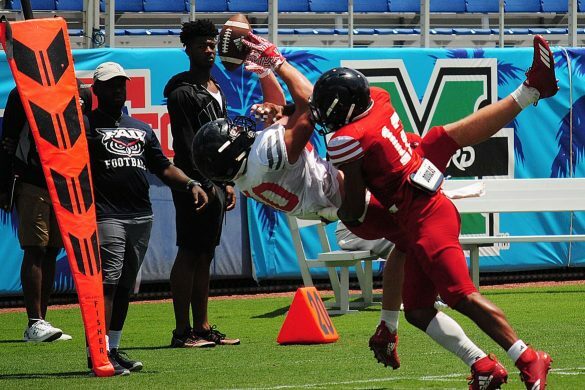 a wide receiver who finished his FAU career after the 2015 season. An undrafted free agent who signed with the Carolina Panthers immediately out of college, Jenson leaves for camp with British Columbia of the Canadian Football League later this month. “Jenson, has kind of always been that role model for me,” Jake said. BOCA RATON – It wasn’t pretty, but FAU came back from a four-run deficit to defeat Charlotte 6-5 on Sunday, completing a weekend sweep of the 49ers. Cody Wilson’s sacrifice fly in the bottom of the eighth inning gave the Owls the lead and Mark Nowatnick pitched out of a jam in the ninth. With a start time moved from noon to 10 a.m. because of expected inclement weather, Sunday’s game was filled with errors, dropped baseballs, and a few hit batters. FAU and Charlotte combined to commit eight errors, five by the 49ers. The 49ers got going early with back to back RBI singles in the top of the first. They then tacked on another run in the top of the second inning thanks in part to a Joe Montes throwing error. 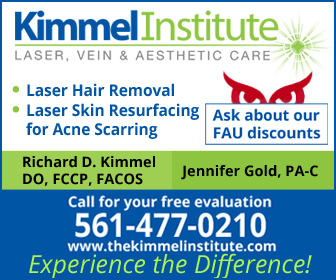 FAU was able to score a run on a throwing error by the 49ers in the bottom of the second, one of their five errors committed throughout the game. Diamond Johnson doubled to right field allowing a runner to score, and another run came in on a throwing error by the right fielder who attempted to throw out Johnson at second base. The throwing error allowed another run to come in. 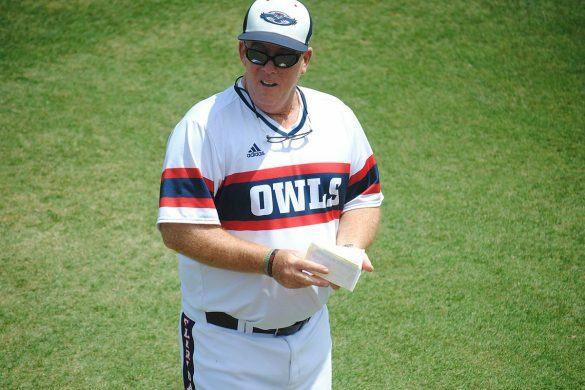 Mark Nowatnick struck out Todd Elwood with runners on first and third with two outs in the bottom of the ninth, giving the Owls their ninth conference win of the season. “This time of year, 32 games in, it’s about just getting the win and moving on,” McCormack said. Moving Forward: Joe Montes went 2 for 5 with a RBI single. …Mark Nowatnick didn’t allow a run in three innings, striking out three to earn the win. …Tyler Frank went 2-for-4 and made a leaping catch. Sliding Backward: Mike Ruff pitched three innings, giving up four hits and three runs. Only one of the runs was earned. …After hitting a walk off home run Saturday night, Eric Rivera went 0-for-5 with a strikeout in the cleanup spot. Key Stat: 7 – times FAU’s opponent scored in the first inning. FAU won all seven of those games. 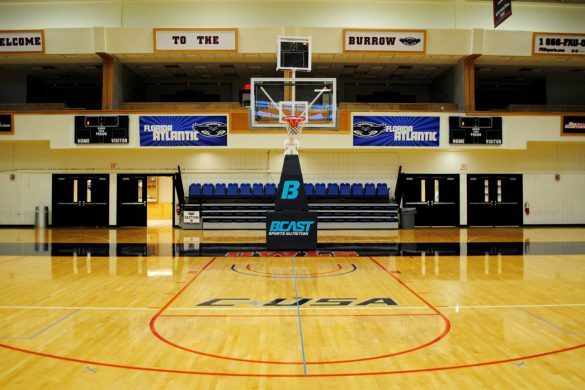 Up Next: FAU heads to Estero to face FGCU on Tuesday. BOCA RATON – Boos roared through the crowd during Tyler Frank’s intentional walk in the bottom of the seventh inning – a managerial move that effectively ended the junior’s bid to break FAU’s record for the longest hitting streak. Although Frank missed his chance at history, Florida Atlantic hit a pair of homers to defeat Charlotte 5-2 in the opening game of the weekend series. Frank walked twice as part of an 0-for-2 night, with the intentional pass coming with two outs and a runner on third, with FAU leading 5-1 in the seventh. In Wednesday’s victory over Miami Frank had tied Kevin Connacher’s hitting streak record of 24 set in 1994. 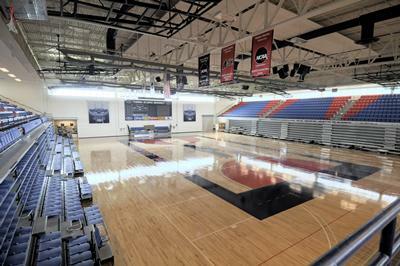 Raymond Church also hit in 24 consecutive games, but his streak spanned two seasons – 2010-11. Some of the fans and players were not happy with Charlotte’ decision not to pitch to Frank late in the game. Both Frank and FAU coach John McCormack characterized the intentional walk as good baseball strategy. Frank nearly extended his hitting streak in the fifth only to be robbed by Jake Whitcomb’s diving catch of a sinking liner in right field. After the catch, the final out of the inning, Frank stared out to right field with his hands on his helmet for a few seconds as the Owls took the field defensively for the top of the sixth. The Owls were given an early lead when Pedro Pages hit a three-run home run into deep right field. The game remained fairly quiet, until Jake Miednik gave up his first run of the game when Zack Smith hit a home run to right field in the top of the sixth inning. FAU wasted no time to answer back, when David Miranda hit his third home run of the season in the bottom of the seventh inning. 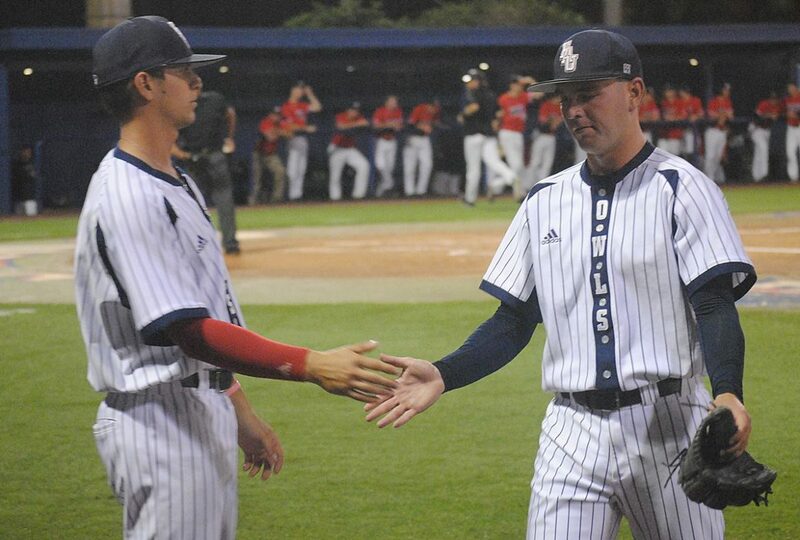 “It was a really good conference matchup pitching wise,” FAU coach John McCormack said. Moving Forward: David Miranda went 2-for-4 with a two-run homer, two RBI and two runs scored. .…Jake Miednik pitched into the ninth inning, only allowing one earned run on four hits to improve to 5-1. …Cody Wilson went 2-for-3. …Drew Peden relieved Miednik and immediately picked Harris Yett off second base. Sliding Backward: The bottom five of the lineup went 2-for-15 with five strikeouts. …Eric Rivera went 0 for 4 with two strikeouts. Key Stat: 108 – Pitches from Miednik. Instant Message: “We’ve got bigger things in mind. We’re trying to win a conference championship.” – Tyler Frank regarding the disappointment of losing his hitting streak. 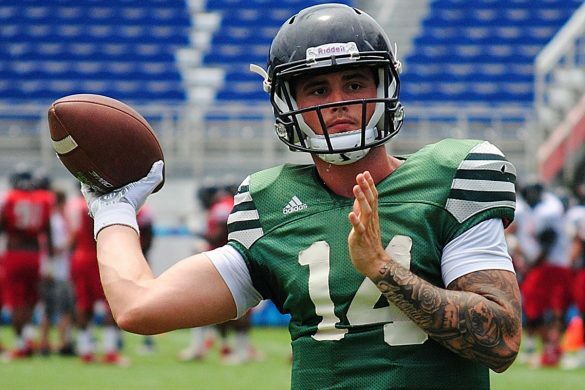 Up Next: First pitch for Saturday’ game against Charlotte is scheduled for 4 p.m.
BOCA RATON – Hard to miss on the football field, Hunter Snyder is no longer as easy to find as he was last year. 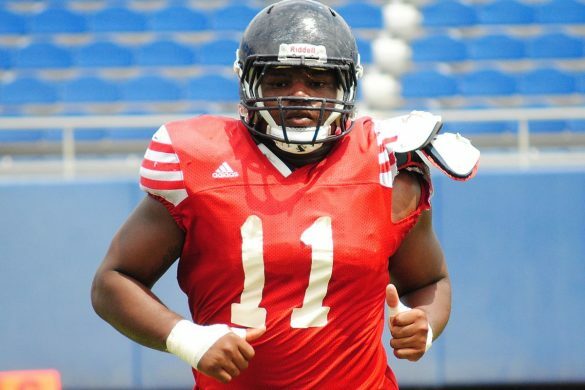 This spring, the 6-foot-7, 260-pound defensive end lined up outside of both tackles. Occasionally, Snyder is even moving to the interior. “He doesn’t have a weakness,” coach Lane Kiffin said. Snyder, a rising senior, finished the 2017 season with six sacks and 57 total tackles. “As productive as any of our players,” Kiffin said. A combination of quickness and strength make Snyder a terror for tackles to deal with off the edge. 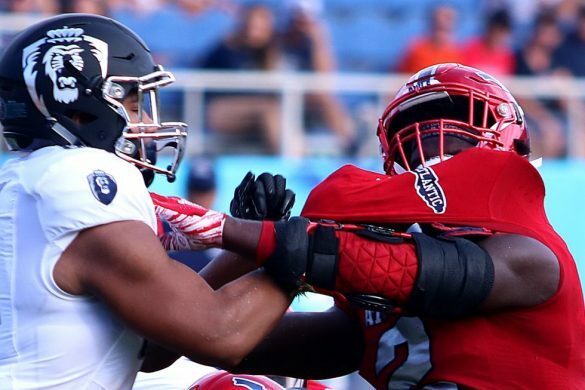 With 13 career sacks, it’s unlikely that Snyder will catch former defensive line mate Trey Hendrickson, now with the New Orleans Saints, who holds the FAU sack record with 29.5. 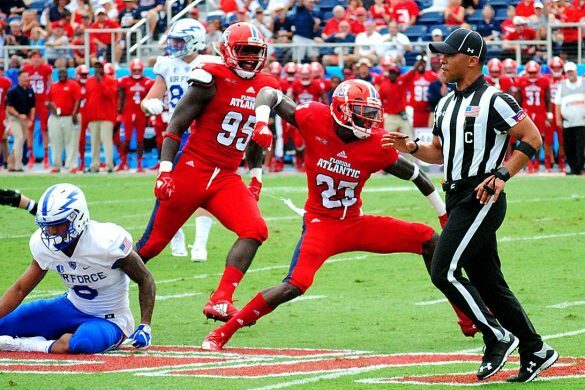 He’ll enter the season in fifth place on FAU’s career sack list, only needing four to climb into second place by himself. Talent has never been the question with Snyder. His biggest issue has always been health. A groin injury limited Snyder last spring and he’s dealt with various other injuries over the past three seasons. 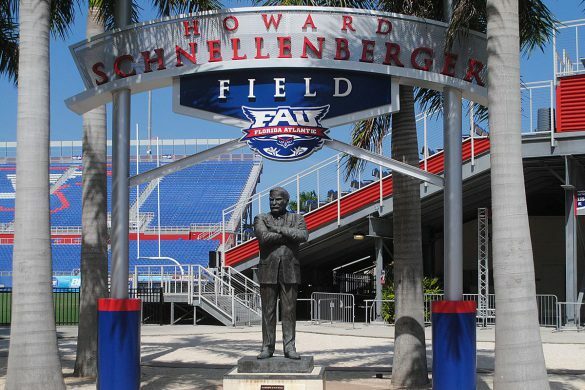 Heading South: FAU will hold Saturday’s practice at Carter Park in Fort Lauderdale. 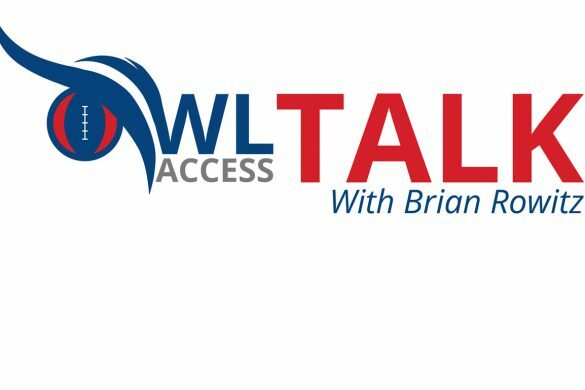 It will be the Owls’ second spring scrimmage and is open to the public. The scrimmage will also serve as a fundraiser for the families of the victims of February’s Parkland-Douglas school shooting. 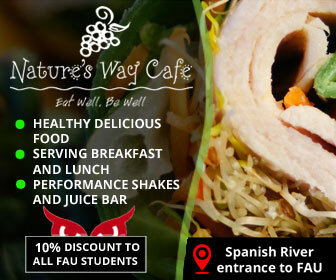 FAU football will be collecting donations from those in attendance. There will also be a youth football camp for children from kindergarten to high school immediately following the scrimmage. 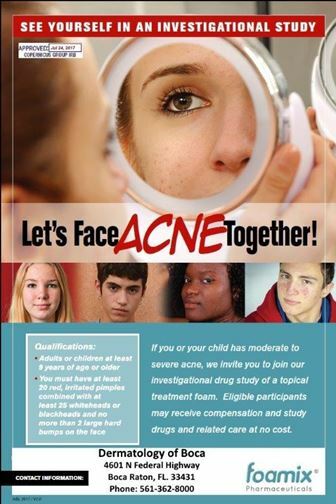 Cost of the camp is $20. Kiffin hopes to have current and former NFL players work as instructors. 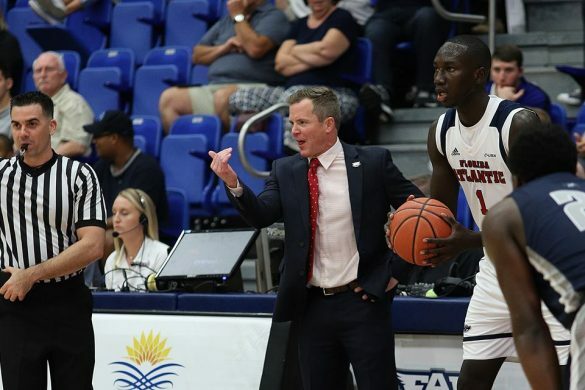 Some current FAU players will also become coaches. “I think it’s really important for our kids to see and to be able to get out there and help,” Kiffin said. Marjory Stoneman Douglas is located in Broward Coutnry, as is Carter Park. FAU’s seven game win streak, along with its six-game streak of scoring 10 or more runs, ended Sunday in a 2-1 loss at Old Dominion. 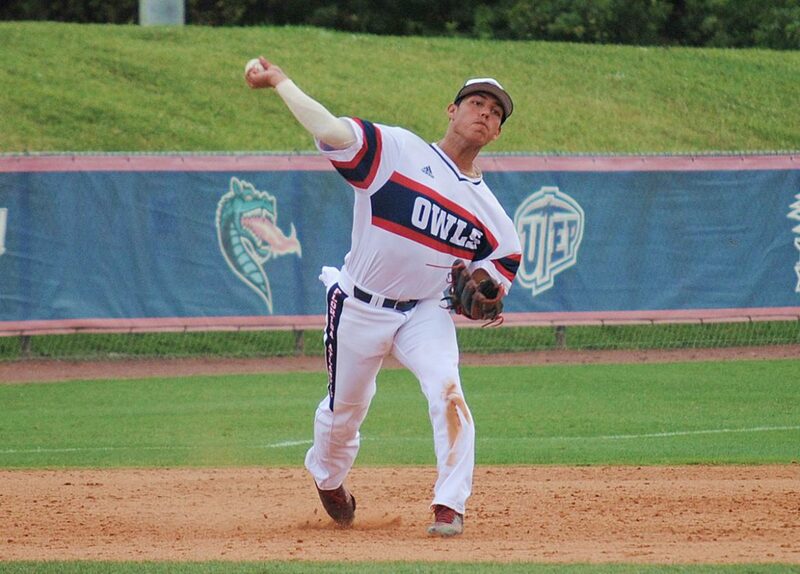 The Owls failed to get the bats going after totaling 22 runs in the first two games. 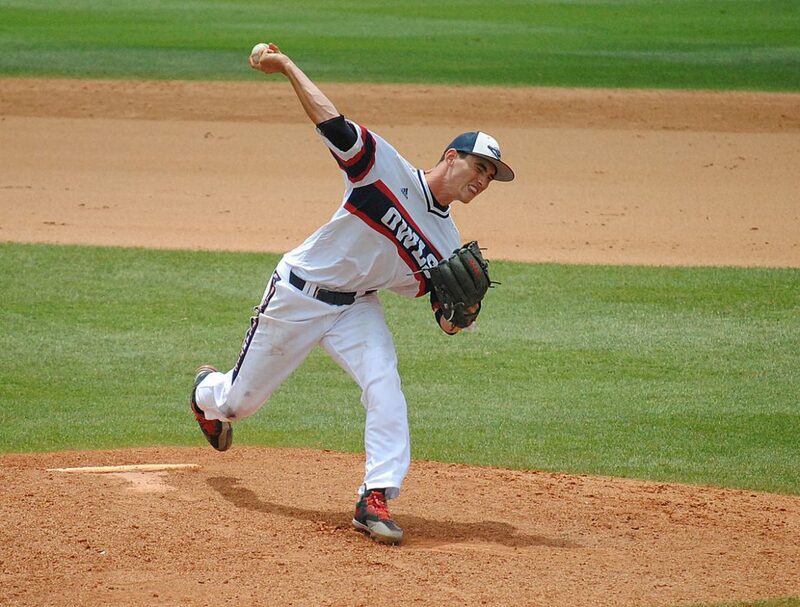 Old Dominion pitchers allowed only six hits on Sunday, and one unearned run, preventing FAU from getting the sweep. The poor offensive afternoon spoiled starting pitcher Vince Coletti’s best performance of the season. He didn’t allow any runs, surrendered only three hits while striking out four strikeouts in six innings. FAU scored when Kevin Abraham raced home on a fourth-inning wild pitch. In the bottom of the seventh inning, Old Dominion’s Tommy Bell singled into left field, tying the score at 1. The Monarchs touch reliever Mark Nowatnick again in the eighth, when Will Morgan singled into right field to bring in what turned out to be the winning run. FAU departs Virginia with a 2-1 series victory. Moving Forward: Coletti has an 11-consecutive inning scoreless streak. Tyler Frank run his hitting streak to 14 games. …The top four batters in the lineup, Frank, Joe Montes, David Miranda and Pedro Pages, all had at least one hit. 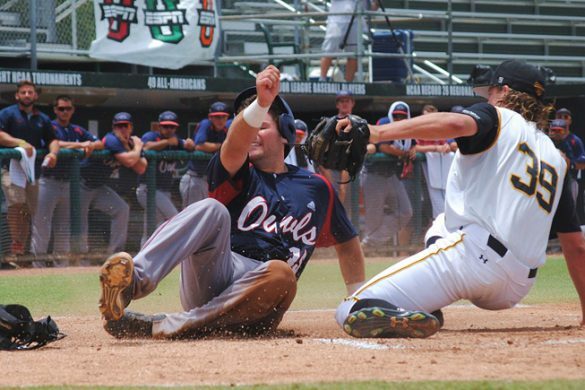 Sliding Backward: The Owls only managed six hits. …The bottom three in the lineup – Eric Rivera, Kevin Abraham and Diamond Johnson – went 0-for-10 in the loss. 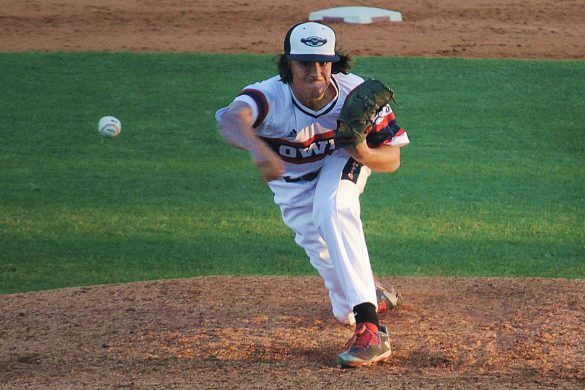 The back of the Owls’ bullpen remains a concern. After nearly blowing a five-run lead late in Wednesday’s victory over North Florida, Nowatnick did blow Sunday’s lead. Key Stat: 11 – FAU runners left on base. 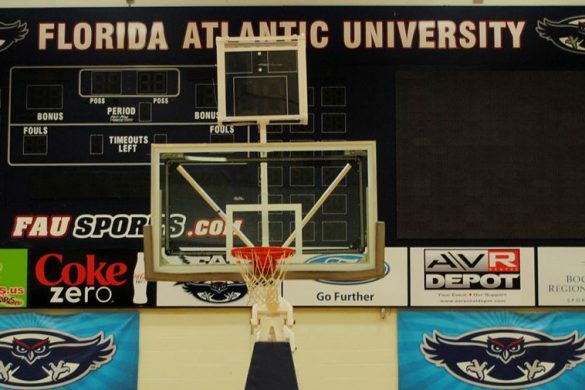 Up Next: FAU goes on the road to take on the Miami Hurricanes Wednesday night at 6 p.m.